The number of schools and teachers registering to play the sports store game is exceeding all expectations. We should have guessed this would be the case given the popularity of the pilot. The team are working hard to make sure all schools and teachers are registered and that we know which subjects the game is being used to support. This is required to help us review impact of game at the end of next year. It also helps us dissuade pupils from picking inappropriate names when playing the game. Some things never change , we have moved on from aliases like Hugh Jarse but highlights some of the challenges involved. Still trying to work out a funding package to get Colleges officially involved. 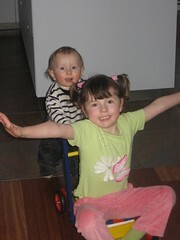 Alexander's latest "learning to walk exercise" is to push Molly-Jean around on a trolley. MJ likes this too.